Do you know how your air conditioning system works? Have you ever heard of the evaporator coil? Whatever type of AC you have, it is a complex machine with numerous parts and mechanisms, all of which work in concert together to produce effective and efficient cooling. It’s a good idea to know the major parts of your AC, so that you know what to look for if you feel that something is not working correctly. In this post, we’d like to review just one of these parts, the evaporator coil. Call Quality Air Heating and Air Conditioning today for comprehensive Columbus air conditioning services, including installation, repair, and maintenance. Your evaporator coil is typically a pyramid-shaped bundle of metal piping that sits within your air handler. It plays a critical role in the refrigerant cycle. As cold liquid refrigerant emerges from the expansion valve, it enters into the evaporator, which interacts with the warm indoor air passing through the air handler. During this thermal exchange, the air is cooled and sent back through the ductwork and into your home for distribution. The refrigerant in the coils evaporates into a gas during this process, hence its name. Underneath your evaporator coil there sits a condensate drain pan because during the evaporation process, condensation forms on the outside of the coils and this needs to go somewhere besides dripping into the air handler. A drainpipe attached to this pan allows the condensation to flow away from your AC. Problems can arise with your evaporator coils during operation. This is mainly due to airflow issues. They can be caused by a clogged air filter that can make your evaporator coil freeze over. If your coils get dirty, then they won’t be able to absorb the thermal energy from your indoor coils, and therefore your cool air won’t be as cool. 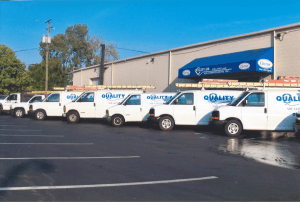 If you’re at all concerned about the operation of your air conditioning system in Columbus, OH, call Quality Air Heating and Air Conditioning today!